Easter is often more inwardly focused than Christmas and Thanksgiving. This year, mark Easter weekend with a significant act of service to your community (restore hiking trails, host a dinner for the homeless and underprivileged, hold a blood drive, run a 10K for a local women’s shelter, etc.) and invite your community to join with your church. In cities where increasing restrictions are affecting public signage, creative churches are using silk-screened, corrugated plastic yard signs. Planted on church members’ front lawns, the signs invite neighbors to Easter services and outreach events. 3. One Card. One Guest. In addition to direct mail, signage, fliers and other materials, promote your Easter service with an e-card that can easily be forwarded along with a personal note from your members. The week before Easter, host a huge, communitywide garage sale to benefit a local charity or cause. Offer a tax receipt to any donors and even offer to pick up larger items. Make it a fun community event by providing food, music and fliers promoting your church’s Easter week activities. 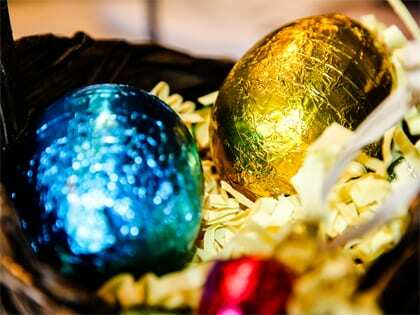 The Sunday before Easter, give children 10 plastic eggs with candy and an invitation for their friends and families to attend the Easter service. It is great to see children involved as inviters. Attract art appreciators to a Maundy Thursday drama of the scene, using Scripture as a script and DaVinci’s painting for costume and backdrop inspiration. Turn a multipurpose room into a gallery of crucifixion art, poetry and music created by people of all ages. Invite the community to participate. Contact a local senior center or assisted living community and asked if your church may bring residents a nostalgic evening of the Irving Berlin classic film, popcorn and lemonade. Host an evening of live orchestra presenting Handel’s oratorio. Engage your city’s orchestra. Organize a car wash free of charge with no strings attached. Just leave a small Easter card with your church’s Easter worship activities in each vehicle. Participate in a communitywide Easter service held at a large local venue, like a school stadium. Bring together pastors from various denominations to plan, pray, share ideas and divide the workload and costs. Instead of putting all your resources into a large Easter church service, develop a team that can conduct Easter services at locations around your community. Housing projects, senior citizen developments, trailer parks, etc., are good places to start. You’ll hit “low mobility” individuals and families who might never have the chance to visit your church and hear the Gospel. Hold a Resurrection Run motorcycle rally each year and invite motorcycle enthusiasts from the community to participate.